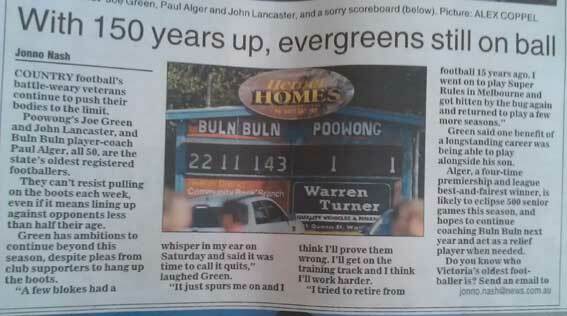 Our scoreboard eyes were drawn to this article in the Herald Sun with a photo of the scoreboard at Buln Buln taken by Alex Coopel…. thanks to David the reader who sent it to us. The quest in the story is right up our alley too. Jonno Nash of the Sun is looking for the Victoria Country Football League’s oldest footballer after finding that three 50-year-olds – Paul Alger (Buln Buln), Joe Green (Poowong) and John Lancaster (Powong) played in the game shown on the scoreboard. If you know of a registered player who is older drop Jonno an email at jonno.nash@news.com.au and let us know by commenting on this post. Buln Buln and Poowong play in the Ellenbank & District Football League.